Arsenal in recent years although the results can not be considered ideal, but the team is no shortage of first-class players. Among them, known for the speed of the "little tiger" Walcott is one. According to the British media "Daily Mirror" message, today, Walcott again for Arsenal "long face"! 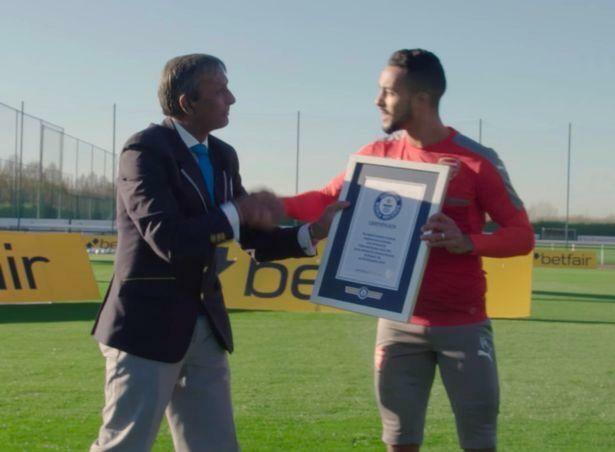 Small tiger firmly catch the ball from the 34 meters high, which also created a new Guinness Book of World Records, and this new world record holder, is Walcott. From the Daily Mirror video can be seen, the four Arsenal players took part in the challenge, namely Coase Cerny, Monreal, Kirklin and Walcott. It is reported that the challenge of the former world record is 32 meters, which is about 10 floors of height. Walcott this look to the 34 meters! The challenge is that when the ball is thrown from the prescribed height (the ball is standing on the crane by the man), and the challenger stands on the ground, the ball will be counted five times before the ball is dropped from the ground Challenge Success. While the remaining three teammates - Coase Czerny, Monreal and Kirklin have failed to challenge. But Walcott has 34 meters high-altitude drop of the ball successfully controlled, and Britain looked around - the success of the challenge! Guinness spokesman Pravin Patel said in an interview: "in the sunny morning to see the four first-class players at the same time to accept the challenge is really great! If the ball is 25 meters from the fall, then it looks easy, but If it is 34 meters, then even for professional players, are very terrible, especially the ball in the process of falling because of wind speed and irregular swing when Walcott did great, congratulations!